"MCG" redirects here. For other uses, see MCG (disambiguation). Since it was built in 1853, the MCG has been in a state of almost constant renewal. It served as the centrepiece stadium of the 1956 Summer Olympics, the 2006 Commonwealth Games and two Cricket World Cups: 1992 and 2015. It is also famous for its role in the development of international cricket; it was the venue for both the first Test match and the first One Day International, played between Australia and England in 1877 and 1971 respectively. The annual Boxing Day Test is one of the MCG's most popular events. Referred to as "the spiritual home of Australian rules football" for its strong association with the sport since it was codified in 1859, it hosts Australian Football League (AFL) matches in the winter, with at least one game held there in most (if not all) rounds of the home-and-away season. The stadium fills to capacity for the AFL Grand Final. The MCG is listed on the Victorian Heritage Register and was included on the Australian National Heritage List in 2005. Journalist Greg Baum called it "a shrine, a citadel, a landmark, a totem" that "symbolises Melbourne to the world". Founded in November 1838 the Melbourne Cricket Club (MCC) selected the current MCG site in 1853 after previously playing at several grounds around Melbourne. The club's first game was against a military team at the Old Mint site, at the corner of William and Latrobe Streets. Burial Hill (now Flagstaff Gardens) became its home ground in January 1839, but the area was already set aside for Botanical Gardens and the club was moved on in October 1846, to an area on the south bank of the Yarra about where the Herald and Weekly Times building is today. The area was subject to flooding, forcing the club to move again, this time to a ground in South Melbourne. It was not long before the club was forced out again, this time because of the expansion of the railway. The South Melbourne ground was in the path of Victoria's first steam railway line from Melbourne to Sandridge (now Port Melbourne). Governor La Trobe offered the MCC a choice of three sites; an area adjacent to the existing ground, a site at the junction of Flinders and Spring Streets or a ten-acre (about 4 hectares) section of the Government Paddock at Richmond next to Richmond Park. This last option, which is now Yarra Park, had been used by Aborigines until 1835. 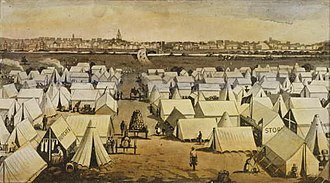 Between 1835 and the early 1860s it was known as the Government or Police Paddock and served as a large agistment area for the horses of the Mounted Police, Border Police and Native Police. The north-eastern section also housed the main barracks for the Mounted Police in the Port Phillip district. In 1850 it was part of a 200-acre (81 ha) stretch set aside for public recreation extending from Governor La Trobe's Jolimont Estate to the Yarra River. By 1853 it had become a busy promenade for Melbourne residents. An MCC sub-committee chose the Richmond Park option because it was level enough for cricket but sloped enough to prevent inundation. That ground was located where the Richmond, or outer, end of the current MCG is now. At the same time the Richmond Cricket Club was given occupancy rights to six acres (2.4 hectares) for another cricket ground on the eastern side of the Government Paddock. At the time of the land grant the Government stipulated that the ground was to be used for cricket and cricket only. This condition remained until 1933 when the State Government allowed the MCG's uses to be broadened to include other purposes when not being used for cricket. In 1863 a corridor of land running diagonally across Yarra Park was granted to the Hobson's Bay Railway and divided Yarra Park from the river. The Mounted Police barracks were operational until the 1880s when it was subdivided into the current residential precinct bordered by Vale Street. The area closest to the river was also developed for sporting purposes in later years including Olympic venues in 1956. View of the Great Southern Stand during the 1998 Boxing Day Test match. The Olympic Stand is visible at the bottom left of the photo. The first grandstand at the MCG was the original wooden members’ stand built in 1854, while the first public grandstand was a 200-metre long 6000-seat temporary structure built in 1861. Another grandstand seating 2000, facing one way to the cricket ground and the other way to the park where football was played, was built in 1876 for the 1877 visit of James Lillywhite's English cricket team. It was during this tour that the MCG hosted the world's first Test match. In 1881 the original members' stand was sold to the Richmond Cricket Club for £55. A new brick stand, considered at the time to be the world's finest cricket facility, was built in its place. The foundation stone was laid by Prince George of Wales and Prince Albert Victor on 4 July and the stand opened in December that year. It was also in 1881 that a telephone was installed at the ground, and the wickets and goal posts were changed from an east-west orientation to north-south. In 1882 a scoreboard was built which showed details of the batsman's name and how he was dismissed. When the Lillywhite tour stand burnt down in 1884 it was replaced by a new stand which seated 450 members and 4500 public. In 1897, second-storey wings were added to ‘The Grandstand’, as it was known, increasing capacity to 9,000. In 1900 it was lit with electric light. 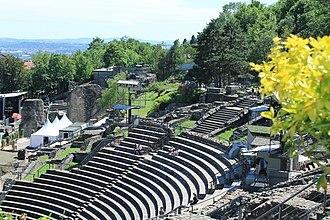 More stands were built in the early 20th century. An open wooden stand was on the south side of the ground in 1904 and the 2084-seat Grey Smith Stand (known as the New Stand until 1912) was erected for members in 1906. The 4000-seat Harrison Stand on the ground's southern side was built in 1908 followed by the 8000-seat Wardill Stand in 1912. In the 15 years after 1897 the stand capacity at the ground increased to nearly 20,000. In 1927 the second brick members’ stand was replaced at a cost of £60,000. The Harrison and Wardill Stands were demolished in 1936 to make way for the Southern Stand which was completed in 1937. The Southern Stand seated 18,200 under cover and 13,000 in the open and was the main public area of the MCG. The maximum capacity of the ground under this configuration, as advised by the Health Department, was 84,000 seated and 94,000 standing. The Northern Stand, also known as the Olympic Stand, was built to replace the old Grandstand for the 1956 Olympic Games. By Health Department regulations, this was to increase the stadium's capacity to 120,000; although this was revised down after the 1956 VFL Grand Final, which could not comfortably accommodate its crowd of 115,802. Ten years later, the Grey Smith Stand and the open concrete stand next to it were replaced by the Western Stand; the Duke of Edinburgh laid a foundation stone for the Western Stand on 3 March 1967, and it was completed in 1968; in 1986, it was renamed the Ponsford Stand in honour of Victorian batsman Bill Ponsford. This was the stadium's highest capacity configuration, and the all-time record crowd for a sporting event at the venue of 121,696 was set under this configuration in the 1970 VFL Grand Final. The MCG was the home of Australia's first full colour video scoreboard, which replaced the old scoreboard in 1982, located on Level 4 of the Western Stand. A second video screen added in 1994 almost directly opposite, on Level 4 of the Olympic stand. In 1985, light towers were installed at the ground, allowing for night football and day-night cricket games. In 1988 inspections of the old Southern Stand found concrete cancer and provided the opportunity to replace the increasingly run-down 50-year-old facility. The projected cost of $100 million was outside what the Melbourne Cricket Club could afford so the Victorian Football League took the opportunity to part fund the project in return for a 30-year deal to share the ground. The new Great Southern Stand was completed in 1992, in time for the 1992 Cricket World Cup, at a final cost of $150 million. The Ponsford Stand undergoing reconstruction in 2003. The 1928 Members' stand, the 1956 Olympic stand and the 1968 Ponsford stand were demolished one by one between late 2003 to 2005 and replaced with a new structure in time for the 2006 Commonwealth Games. Despite now standing as a single unbroken stand, the individual sections retain the names of Ponsford, Olympic and Members Stands. The redevelopment cost exceeded A$400 million and pushed the ground's capacity to just above 100,000. Since redevelopment, the highest attendance was the 2018 Grand Final of the AFL with 100,022, followed by 100,021 in the 2017 Grand Final. From 2011 until 2013, the Victorian Government and the Melbourne Cricket Club funded a $55 million refurbishment of the facilities of Great Southern Stand, including renovations to entrance gates and ticket outlets, food and beverage outlets, etc., without significantly modifying the stand. New scoreboards, more than twice the size of the original ones, were installed in the same positions in late 2013. The first cricket match at the venue was played on 30 September 1854. The first inter-colonial cricket match to be played at the MCG was between Victoria and New South Wales in March 1856. Victoria had played Tasmania (then known as Van Diemen's Land) as early as 1851 but the Victorians had included two professionals in the 1853 team upsetting the Tasmanians and causing a cooling of relations between the two colonies. To replace the disgruntled Tasmanians the Melbourne Cricket Club issued a challenge to play any team in the colonies for £1000. Sydney publican William Tunks accepted the challenge on behalf of New South Wales although the Victorians were criticised for playing for money. Ethics aside, New South Wales could not afford the £1000 and only managed to travel to Melbourne after half the team's travel cost of £181 was put up by Sydney barrister Richard Driver. The game eventually got under way on 26 March 1856. The Victorians, stung by criticism over the £1000 stake, argued over just about everything; the toss, who should bat first, whether different pitches should be used for the different innings and even what the umpires should wear. Victoria won the toss but New South Wales captain George Gilbert successfully argued that the visiting team should decide who bats first. The MCG was a grassless desert and Gilbert, considering players fielded without boots, promptly sent Victoria into bat. Needing only 16 to win in the final innings, New South Wales collapsed to be 5 for 5 before Gilbert's batting saved the game and the visitors won by three wickets. In subsequent years conditions at the MCG improved but the ever-ambitious Melburnians were always on the lookout for more than the usual diet of club and inter-colonial games. In 1861, Felix William Spiers and Christopher Pond, the proprietors of the Cafe de Paris in Bourke Street and caterers to the MCC, sent their agent, W.B. Mallam, to England to arrange for a cricket team to visit Australia. Mallam found a team and, captained by Heathfield Stephenson, it arrived in Australia on Christmas Eve 1861 to be met by a crowd of more than 3000 people. The team was taken on a parade through the streets wearing white-trimmed hats with blue ribbons given to them for the occasion. Wherever they went they were mobbed and cheered by crowds to the point where the tour sponsors had to take them out of Melbourne so that they could train undisturbed. Their first game was at the MCG on New Year's Day 1862, against a Victorian XVIII. The Englishmen also wore coloured sashes around their waists to identify each player and were presented with hats to shade them from the sun. Some estimates put the crowd at the MCG that day at 25,000. It must have been quite a picture with a new 6000 seat grandstand, coloured marquees ringing the ground and a carnival outside. Stephenson said that the ground was better than any in England. The Victorians however, were no match for the English at cricket and the visitors won by an innings and 96 runs. Over the four days of the ‘test’ more than 45,000 people attended and the profits for Speirs and Pond from this game alone was enough to fund the whole tour. At that time it was the largest number of people to ever watch a cricket match anywhere in the world. Local cricket authorities went out of their way to cater for the needs of the team and the sponsors. They provided grounds and sponsors booths without charge and let the sponsors keep the gate takings. The sponsors however, were not so generous in return. They quibbled with the Melbourne Cricket Club about paying £175 for damages to the MCG despite a prior arrangement to do so. The last match of the tour was against a Victorian XXII at the MCG after which the English team planted an elm tree outside the ground. Following the success of this tour, a number of other English teams also visited in subsequent years. George Parr's side came out in 1863–64 and there were two tours by sides led by W.G. Grace. The fourth tour was led by James Lillywhite. 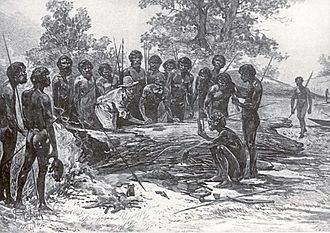 On Boxing Day 1866 an Indigenous Australian cricket team played at the MCG with 11,000 spectators against an MCC team. A few players in that match were in a later team that toured England in 1868. Some also played in three other matches at the ground before 1869. Up until the fourth tour in 1877, led by Lillywhite, touring teams had played first-class games against the individual colonial sides, but Lillywhite felt that his side had done well enough against New South Wales to warrant a game against an All Australian team. When Lillywhite headed off to New Zealand he left Melbourne cricketer John Conway to arrange the match for their return. Conway ignored the cricket associations in each colony and selected his own Australian team, negotiating directly with the players. Not only was the team he selected of doubtful representation but it was also probably not the strongest available as some players had declined to take part for various reasons. Demon bowler Fred Spofforth refused to play because wicket-keeper Billy Murdoch was not selected. Paceman Frank Allan was at Warnambool Agricultural Show and Australia's best all-rounder Edwin Evans could not get away from work. In the end only five Australian-born players were selected. The same could be said for Lillywhite's team which, being selected from only four counties, meant that some of England's best players did not take part. In addition, the team had a rough voyage back across the Tasman Sea and many members had been seasick. The game was due to be played on 15 March, the day after their arrival, but most had not yet fully recovered. On top of that, wicket-keeper Ted Pooley was still in a New Zealand prison after a brawl in a Christchurch pub. England was nonetheless favourite to win the game and the first ever Test match began with a crowd of only 1000 watching. The Australians elected Dave Gregory from New South Wales as Australia's first ever captain and on winning the toss he decided to bat. Charles Bannerman scored an unbeaten 165 before retiring hurt. Sydney Cricket Ground curator, Ned Gregory, playing in his one and only Test for Australia, scored Test cricket's first duck. Australia racked up 245 and 104 while England scored 196 and 108 giving Australia victory by 45 runs. The win hinged on Bannerman's century and a superb bowling performance by Tom Kendall who took 7 for 55 in England's second innings. A fortnight later there was a return game, although it was really more of a benefit for the English team. Australia included Spofforth, Murdoch and T.J.D. Cooper in the side but this time the honours went to England who won by four wickets. Two years later Lord Harris brought another England team out and during England's first innings in the Test at the MCG, Fred Spofforth took the first hat-trick in Test cricket. He bagged two hauls of 6 for 48 and 7 for 62 in Australia's ten wicket win. Through most of the 20th century, the Melbourne Cricket Ground was one of the two major Test venues in Australia (along with the Sydney Cricket Ground), and it would host one or two Tests in each summer in which Tests were played; since 1982, the Melbourne Cricket Ground has hosted one Test match each summer. Until 1979, the ground almost always hosted its match or one of its matches over the New Year, with the first day's play falling somewhere between 29 December and 1 January; in most years since 1980 and every year since 1995, its test has begun on Boxing Day, and it is now a standard fixture in the Australian cricket calendar and is known as the Boxing Day Test. The venue also hosts one-day international matches each year, and Twenty20 international matches most years. No other venue in Melbourne has hosted a Test, and Docklands Stadium is the only other venue to have hosted a limited-overs international. The Victorian first-class team plays Sheffield Shield cricket at the venue during the season. Prior to Test cricket being played on Boxing Day, it was a long-standing tradition for Victoria to host New South Wales in a first-class match on Boxing Day. Victoria also played its limited overs matches at the ground. Since the introduction of the domestic Twenty20 Big Bash League (BBL) in 2011, the Melbourne Stars club has played its home matches at the ground. It is also the home ground of the Melbourne Stars Women team, which plays in the Women's Big Bash League (WBBL). By the 1980s, the integral MCG pitch – grown from Merri Creek black soil – was considered the worst in Australia, in some matches exhibiting wildly inconsistent bounce which could see balls pass through as grubbers or rear dangerously high – a phenomenon which was put down to damage caused by footballers in winter and increased use for cricket during the summers of the 1970s. The integral pitch has since been removed and drop-in pitches have been used since 1996, generally offering consistent bounce and a fair balance between bat and ball. The second day of the 2006 Boxing Day Test match. The highest first class team score in history was posted at the MCG in the Boxing Day match against New South Wales in 1926–27. Victoria scored 1107 in two days, with Bill Ponsford scoring 352 and Jack Ryder scoring 295. One of the most sensational incidents in Test cricket occurred at the MCG during the Melbourne test of the 1954–55 England tour of Australia. Big cracks had appeared in the pitch during a very hot Saturday's play and on the rest day Sunday, groundsman Jack House watered the pitch to close them up. This was illegal and the story was leaked by The Age newspaper. 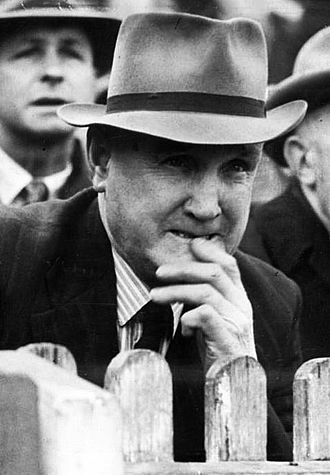 The teams agreed to finish the match and England won by 128 runs after Frank Tyson took 7 for 27 in the final innings. An incident in the second Test of the 1960–61 series involved the West Indies player Joe Solomon being given out after his hat fell on the stumps after being bowled at by Richie Benaud. The crowd sided with the West Indies over the Australians. Not only was the first Test match played at the MCG, the first One Day International match was also played there, on 5 January 1971, between Australia and England. The match was played on what was originally scheduled to have been the fifth day of a Test match, but the Test was abandoned after the first three days were washed out. Australia won the 40-over match by 5 wickets. The next ODI was played on August 1972, some 19 months later. In March 1977, the Australian Cricket Board assembled 218 of the surviving 224 Australia-England players for a Test match to celebrate 100 years of Test cricket between the two nations. The match was the idea of former Australian bowler and MCC committee member Hans Ebeling who had been responsible for developing the cricket museum at the MCG. The match had everything. England's Derek Randall scored 174, Australia's Rod Marsh also got a century, Lillee took 11 wickets, and David Hookes, in his first test, smacked five fours in a row off England captain Tony Greig's bowling. Rick McCosker who opened for Australia suffered a fractured jaw after being hit by a sharply rising delivery. He left the field but came back in the second innings with his head swathed in bandages. Australia won the match by 45 runs, exactly the same margin as the first Test in 1877. Another incident occurred on 1 February 1981 at the end of a one-day match between Australia and New Zealand. New Zealand, batting second, needed six runs off the last ball of the day to tie the game. Australian captain, Greg Chappell instructed his brother Trevor, who was bowling the last over, to send the last ball down underarm to prevent the New Zealand batsman, Brian McKechnie, from hitting the ball for six. Although not entirely in the spirit of the game, an underarm delivery was quite legal, so long as the arm was kept straight. The Laws of cricket have since been changed to prevent such a thing happening again. The incident has long been a sore point between Australia and New Zealand. In February and March 1985 the Benson & Hedges World Championship of Cricket was played at the MCG, a One Day International tournament involving all of the then Test match playing countries to celebrate 150 years of the Australian state of Victoria. 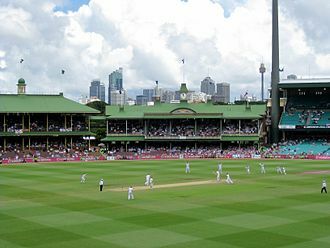 Some matches were also played at Sydney Cricket Ground. The MCG hosted the 1992 Cricket World Cup Final between Pakistan and England with a crowd of more than 87,000. Pakistan won the match after an all-round performance by Wasim Akram who scored 33 runs and picked up 3 crucial wickets to make Pakistan cricket world champions for the first and as yet only time. During the 1995 Boxing Day Test at the MCG, Australian umpire Darrell Hair called Sri Lankan spin bowler Muttiah Muralitharan for throwing the ball, rather than bowling it, seven times during the match. The other umpires did not call him once and this caused a controversy, although he was later called for throwing by other umpires seven other times in different matches. The MCG is known for its great atmosphere, much of which is generated in the infamous Bay 13, situated almost directly opposite to the members stand. In the late 1980s, the crowd at Bay 13 would often mimic the warm up stretches performed by Merv Hughes. In a 1999 One-Day International, the behaviour of Bay 13 was so bad that Shane Warne, donning a helmet for protection, had to enter the ground from his dressing rooms and tell the crowd to settle down at the request of opposing England captain Alec Stewart. The MCG hosted three pool games as part of the 2015 ICC Cricket World Cup as well as a quarter-final, and then the final on 29 March. Australia comfortably defeated New Zealand by seven wickets in front of an Australian record cricket crowd of 93,013. In 2017-18 Ashes series, Alastair Cook scored the highest score by an English batsman and second double century since Wally Hammond at the ground. Steve Smith scored his 4th consecutive century at the ground (2014-2017) in reply, being the only player since Don Bradman (1928–31) to do so. Smith also lasted 1093 days, or scored 455 runs, between two wickets fallen. The match ended in a draw, dashing hopes of Australia achieving the third Ashes sweep in the 21st Century. The wicket used for the Boxing Day test was the first Australian wicket ever to be rated 'poor' by the ICC. Despite being called the Melbourne Cricket Ground, the stadium has been and continues to be used much more often for Australian rules football. Spectator numbers for football are larger than for any other sport in Australia, and it makes more money for the MCG than any of the other sports played there. Although the Melbourne Cricket Club members were instrumental in founding Australian Rules Football, there were understandable concerns in the early days about the damage that might be done to the playing surface if football was allowed to be played at the MCG. Therefore, football games were often played in the parklands next to the cricket ground, and this was the case for the first documented football match to be played at the ground. The match which today is considered to be the first Australian rules football, played between Melbourne Grammar and Scotch College over three Saturdays beginning 7 August 1858 was played in this area. It wasn’t until 1869 that football was played on the MCG proper, a trial game involving a police team. It was not for another ten years, in 1879, after the formation of the Victorian Football Association, that the first official match was played on the MCG and the cricket ground itself became a regular venue for football. Two night matches were played on the ground during the year under the newly invented electric light. In the early years, the MCG was the home ground of Melbourne Football Club, Australia's oldest club, established in 1858 by the founder of the game itself, Thomas Wills. Melbourne won five premierships during the 1870s using the MCG as its home ground. The first of nearly 3000 Victorian Football League/Australian Football League games to be played at the MCG was on 15 May 1897, with Melbourne beating Geelong 64 to 19. Several Australian Football League (AFL) clubs later joined Melbourne in using the MCG as their home ground for matches: Richmond (1965), North Melbourne (1985), Essendon (1992), Collingwood (started moving in 1994, became a full-time tenant in 2000) and Hawthorn (2000). Melbourne used the venue as its training base until 1984, before being required to move to preserve the venue's surface when North Melbourne began playing there. 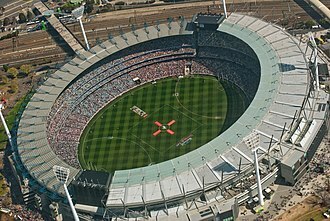 The VFL/AFL Grand Final has been played at the MCG every season since 1902, except in 1924 when no Grand Final was held because of the season's round-robin finals format (it hosted three of the six games in the Finals Series) 1942–1945, when the ground was used by the military during World War II; and in 1991, as the construction of the Great Southern Stand had temporarily reduced the ground's capacity below that of Waverley Park. All three Grand Final Replays have been played at the MCG. Before the ground was fully seated, the Grand Final could draw attendances above 110,000. The record for the highest attendance in the history of the sport was set in the 1970 VFL Grand Final, with 121,696 in attendance. 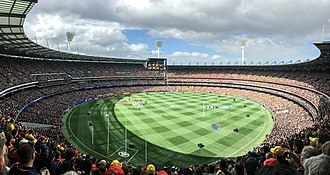 Since being fully seated, Grand Final attendances are typically between 95,000 and 100,000, with the record of 100,022 in the 2018 grand final, followed by 100,021 attending the 2017 AFL Grand Final. In the modern era, most finals games held in Melbourne have been played at the MCG. Under the current contract, ten finals (excluding the Grand Final) must be played at the MCG over a five-year period. Under previous contracts, the MCG was entitled to host at least one match in each week of the finals, which on several occasions required non-Victorian clubs to play "home" finals in Victoria. On 12 April 2018, the AFL, Victorian Government and Melbourne Cricket Club (MCC) announced that the MCG would continue to host the Grand Final until at least 2057. All Melbourne based teams (and most of the time Geelong) play their 'home' finals at the MCG unless if 4 Victorian teams win the right to host a final in the first week of the finals. For many years the VFL had an uneasy relationship with the MCG trustees and the Melbourne Cricket Club. Both needed the other, but resented the dependence. The VFL made the first move which brought things to a head by beginning the development of VFL Park at Mulgrave in the 1960s as its own home ground and as a potential venue for future grand finals. Then in 1983, president of the VFL, Allen Aylett started to pressure the MCG Trust to give the VFL a greater share of the money it made from using the ground for football. In March 1983 the MCG trustees met to consider a submission from Aylett. Aylett said he wanted the Melbourne Cricket Club's share of revenue cut from 15 per cent to 10 per cent. He threatened to take the following day's opening game of the season, Collingwood vs Melbourne, away from the MCG. The money was held aside until an agreement could be reached. Different deals, half deals and possible deals were done over the years, with the Premier of Victoria, John Cain, Jr., even becoming involved. Cain was said to have promised the VFL it could use the MCG for six months of the year and then hand it back to the MCC, but this never eventuated, as the MCG Trust did not approve it. In the mid-1980s, a deal was done where the VFL was given its own members area in the Southern Stand. Against this background of political manoeuvring, in 1985 North Melbourne became the third club to make the MCG its home ground. In the same year, North played in the first night football match at the MCG for almost 110 years, against Collingwood on 29 March 1985. In 1986, only a month after Ross Oakley had taken over as VFL Commissioner, VFL executives met with the MCC and took a big step towards resolving their differences. Changes in the personnel at the MCC also helped. In 1983 John Lill was appointed secretary and Don Cordner its president. Shortly after the Southern Stand opened in 1992, the Australian Football League moved its headquarters into the complex. The AFL assisted with financing the new stand and came to an agreement that ensures at least 45 AFL games are played at the MCG each year, including the Grand Final in September. Another 45 days of cricket are also played there each year and more than 3.5 million spectators come to watch every year. As of the end of 2011, Matthew Richardson holds the records for having scored the most goals on the MCG, and Kevin Bartlett holds the record for playing the most matches at the MCG. Two players have scored 14 goals for an AFL or VFL game in one match at the MCG: Gary Ablett, Sr. in 1989 and 1993, and John Longmire in 1990. Before an AFL match between Richmond and Carlton on 27 August 1999, the city end scoreboard caught on fire due to an electrical fault, causing the start of play to be delayed by half an hour. During World War II, the government requisitioned the MCG for military use. From 1942 until 1945 it was occupied by (in order): the United States Army Air Forces, the Royal Australian Air Force, the United States Marine Corps and again the RAAF. Over the course of the war, more than 200,000 personnel were barracked at the MCG. From April to October 1942, the US Army's Fifth Air Force occupied the ground, naming it "Camp Murphy", in honor of officer Colonel William Murphy, a senior USAAF officer killed in Java. In 1943 the MCG was home to the legendary First Regiment of the First Division of the United States Marine Corps. The First Marine Division were the heroes of the Guadalcanal campaign and used the "cricket grounds", as the marines referred to it, to rest and recuperate. On 14 March 1943 the marines hosted a giant "get together" of American and Australian troops on the arena. In 1977, Melbourne Cricket Club president Sir Albert Chadwick and Medal of Honor recipient, Colonel Mitchell Paige, unveiled a commemorative plaque recognizing the Americans' time at the ground. In episode 3 of the 2010 TV miniseries, The Pacific, members of the US Marines are shown to be camped in the war-era MCG. The MCG's most famous moment in history was as the main stadium for the 1956 Olympic Games, hosting the opening and closing ceremonies, track and field events, and the finals in field hockey and soccer. The MCG was only one of seven possible venues, including the Melbourne Showgrounds, for the Games’ main arena. The MCG was the Federal Government's preferred venue but there was resistance from the MCC. The inability to decide on the central venue nearly caused the Games to be moved from Melbourne. Prime Minister Robert Menzies recognised the potential embarrassment to Australia if this happened and organised a three-day summit meeting to thrash things out. Attending was Victorian Premier John Cain, Sr., the Prime Minister, deputy opposition leader Arthur Calwell, all State political leaders, civic leaders, Olympic officials and trustees and officials of the MCC. Convening the meeting was no small effort considering the calibre of those attending and that many of the sports officials were only part-time amateurs. As 22 November, the date of the opening ceremony, drew closer, Melbourne was gripped ever more tightly by Olympic fever. At 3 pm the day before the opening ceremony, people began to line up outside the MCG gates. That night the city was paralysed by a quarter of a million people who had come to celebrate. The MCG's capacity was increased by the new Olympic (or Northern) Stand, and on the day itself 103,000 people filled the stadium to capacity. A young up and coming distance runner was chosen to carry the Olympic torch into the stadium for the opening ceremony. Although Ron Clarke had a number of junior world records for distances of 1500 m, one mile (1.6 km) and two miles (3 km), he was relatively unknown in 1956. Perhaps the opportunity to carry the torch inspired him because he went on to have a career of exceptional brilliance and was without doubt the most outstanding runner of his day. At one stage he held the world record for every distance from two miles (3 km) to 20 km. His few failures came in Olympic and Commonwealth Games competition. Although favourite for the gold at Tokyo in 1964 he was placed ninth in the 5,000 metres race and the marathon and third in the 10,000 metres. He lost again in the 1966 Commonwealth Games and in 1968 at altitude in Mexico he collapsed at the end of the 10 km race. On that famous day in Melbourne in 1956 the torch spluttered and sparked, showering Clarke with hot magnesium, burning holes in his shirt. When he dipped the torch into the cauldron it burst into flame singeing him further. In the centre of the ground, John Landy, the fastest miler in the world, took the Olympic oath and sculler Merv Wood carried the Australian flag. The Melbourne Games also saw the high point of Australian female sprinting with Betty Cuthbert winning three gold medals at the MCG. She won the 100 m and 200 m and anchored the winning 4 x 100 m team. Born in Merrylands in Sydney's west she was a champion schoolgirl athlete and had already broken the world record for the 200 m just before the 1956 Games. She was to be overshadowed by her Western Suburbs club member, the Marlene Matthews. When they got to the Games, Matthews was the overwhelming favourite especially for the 100 m a distance over which Cuthbert had beaten her just once. Both Matthews and Cuthbert won their heats with Matthews setting an Olympic record of 11.5 seconds in hers. Cuthbert broke that record in the following heat with a time of 11.4 seconds. The world record of 11.3 was held by another Australian, Shirley Strickland who was eliminated in her heat. In the final Matthews felt she got a bad start and was last at the 50 metre mark. Cuthbert sensed Isabella Daniels from the USA close behind her and pulled out a little extra to win Australia's first gold at the Games in a time of 11.5 seconds, Matthews was third. The result was repeated in the 200 m final. Cuthbert won her second gold breaking Marjorie Jackson's Olympic record. Mathews was third again. By the time the 1956 Olympics came around, Shirley Strickland was a mother of 31 years of age but managed to defend her 80 m title, which she had won in Helsinki four years before, winning gold and setting a new Olympic record. The sensational incident of the track events was the non-selection of Marlene Matthews in the 4 x 100 m relay. Matthews trained with the relay team up until the selection was made but Cuthbert, Strickland, Fleur Mellor and Norma Croker were picked for the team. There was outrage at the selection which increased when Matthews went on to run third in both the 100 m and 200 m finals. Personally she was devastated and felt that she had been overlooked for her poor baton change. Strickland was disappointed with the way Matthews was treated and maintained it was an opinion held in New South Wales that she had baton problems. One of the selectors, Doris Magee from NSW, said that selecting Matthews increased the risk of disqualification at the change. But Cuthbert maintained that the selectors made the right choice saying that Fleur Mellor was fresh, a specialist relay runner and was better around the curves than Matthews. The men did not fare so well. The 4 x 400 m relay team, including later IOC Committee member Kevan Gosper, won silver. Charles Porter also won silver in the high jump. Hec Hogan won bronze in the 100 m to become the first Australian man to win a medal in a sprint since the turn of the century and despite injury John Landy won bronze in the 1500 m. Allan Lawrence won bronze in the 10,000 m event. Apart from athletics, the stadium was also used for the soccer finals, the hockey finals, the Opening and Closing Ceremonies, and an exhibition game of baseball between the Australian National Team and a US armed services team at which an estimated crowd of 114,000 attended. This was the Guinness World Record for the largest attendance for any baseball game, which stood until a 29 March 2008 exhibition game between the Boston Red Sox and Los Angeles Dodgers at the Los Angeles Coliseum (also a former Olympic venue in 1932 and 1984) drawing 115,300. The MCG was also used for another demonstration sport, Australian Rules. The Olympics being an amateur competition meant that only amateurs could play in the demonstration game. A combined team of amateurs from the VFL and VFA were selected to play a state team from the Victorian Amateur Football Association (VAFA). The game was played 7 December 1956 with the VAFA side, wearing white jumpers, green collars and the Olympic rings on their chests, winning easily 81 to 55. One of the players chosen for the VFA side was Lindsay Gaze (although he never got off the bench) who would go on to make his mark in another sport, basketball, rather than Australian Rules. The MCG's link with its Olympic past continues to this day. Within its walls is the IOC-endorsed Australian Gallery of Sport and Olympic Museum. Forty-four years later at the 2000 Summer Olympics in Sydney, the ground hosted several soccer preliminaries, making it one of a few venues ever used for more than one Olympics. The Opening and Closing Ceremonies of the 2006 Commonwealth Games were held at the MCG, as well as athletics events during the games. 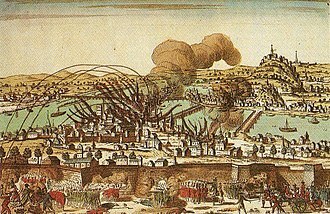 The games began on 15 March and ended on 26 March. The seating capacity of the stadium during the games was 80,000. A total of 47 events were contested, of which 24 by male and 23 by female athletes. Furthermore, three men's and three women's disability events were held within the programme. 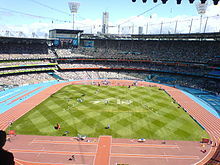 All athletics events took place within the Melbourne Cricket Ground, while the marathon and racewalking events took place on the streets of Melbourne and finished at the main stadium. The first game of Rugby Union to be played on the ground was on Saturday, 29 June 1878, when the Waratah Club of Sydney played Carlton Football Club in a return of the previous year's contests in Sydney where the clubs had competed in both codes of football. The match, watched by a crowd of between 6,000 and 7,000 resulted in a draw; one goal and one try being awarded to each team. It was not until 19 August 1899 that the MCG was again the venue for a Union match, this time Victoria v the British Lions (as they were later to be called). During the preceding week the Victorians had held several trial and practice matches there, as well as several training sessions, despite which they were defeated 30–0 on the day before a crowd of some 7,000. Nine years later, on Monday, 10 August 1908, Victoria was again the host, this time to the Australian team en route to Great Britain and soon to be dubbed the First Wallabies. Despite being held on a working day some 1,500 spectators attended to see the visitors win by 26–6. On Saturday, 6 July 1912 the MCG was the venue, for the only time ever, of a match between two Victorian Rugby Union clubs, Melbourne and East Melbourne, the former winning 9–5 in what was reported to be ‘... one of the finest exhibitions of the Rugby game ever seen in Victoria.’ It was played before a large crowd as a curtain raiser to a State Rules match against South Australia. On Saturday 18 June 1921, in another curtain raiser, this time to a Melbourne-Fitzroy League game, a team representing Victoria was soundly beaten 51–0 by the South African Springboks in front of a crowd of 11,214. The first post war match at the MCG was on 21 May 1949 when the NZ Maoris outclassed a Southern States side 35–8 before a crowd of close to 10,000. A year later, on 29 July 1950, for the first and only time, Queensland travelled to Victoria to play an interstate match, defeating their hosts 31–12 before a crowd of 7,479. In the following year the MCG was the venue for a contest between the New Zealand All Blacks and an Australian XV . This was on 30 June 1951 before some 9,000 spectators and resulted in a convincing 56–11 win for the visitors. 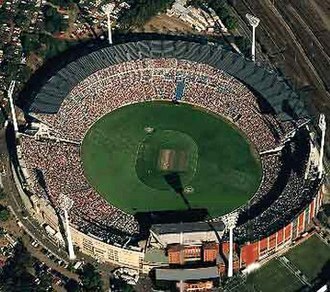 Union did not return the MCG until the late 1990s, for several night time Test matches, both Australia v New Zealand All Blacks as part of the Tri Nations Series. The first, on Saturday 26 July 1997, being notable for an attendance of 90,119, the visitors winning 33–18 and the second, on Saturday 11 July 1998, for a decisive victory to Australia of 24–16. Australia and New Zealand met again at the MCG during the 2007 Tri Nations Series on 30 June, the hosts again winning, this time by 20 points to 15 in front of a crowd of 79,322. Rugby league was first played at the ground on 15 August 1914, with the New South Wales team losing to England 15–21. The first ever State of Origin match at the MCG (and second in Melbourne) was Game II of the 1994 series, and the attendance of 87,161 set a new record rugby league crowd in Australia. The MCG was also the venue for Game II of the 1995 State of Origin series and drew 52,994, the most of any game that series. The second game of the 1997 State of Origin series, which, due to the Super League war only featured Australian Rugby League-signed players, was played there too, but only attracted 25,105, the lowest in a series that failed to attract over 35,000 to any game. The Melbourne Storm played two marquee games at the MCG in 2000. This was the first time that they had played outside of their normal home ground of Olympic Park Stadium which held 18,500 people. Their first game was held on 3 March 2000 against the St. George Illawarra Dragons in a rematch of the infamous 1999 NRL Grand Final. Dragons player Anthony Mundine said the Storm were 'not worthy premiers' and they responded by running in 12 tries to two, winning 70–10 in front of 23,239 fans. This was their biggest crowd they had played against until 33,427 turned up to the 2007 Preliminary Final at Docklands Stadium which saw Melbourne defeat the Parramatta Eels 26–10. The record home and away crowd record has also been overhauled, when a match at Docklands in 2010 against St George attracted 25,480 spectators. Their second game attracted only 15,535 spectators and was up against the Cronulla Sharks on 24 June 2000. Once again, the Storm won 22–16. It was announced in June 2014 that the ground would host its first State of Origin match since 1997. Game II of the 2015 series was played at the venue, with an all-time record State of Origin crowd of 91,513 attending the match. The attendance is 19th on the all time rugby league attendance list and the 4th highest rugby league attendance in Australia. On 9 February 2006 Victorian premier Steve Bracks and Football Federation Australia chairman Frank Lowy announced that the MCG would host a world class soccer event each year from 2006 until 2009 inclusive. Australia and Greece playing an International Friendly at the MCG on 25 May 2006. The agreement sees an annual fixture at the MCG, beginning with a clash between Australia and European champions Greece on 25 May 2006 in front of a sell-out crowd of 95,103, before Australia left to contest in the World Cup finals. Australia beat Greece 1–0. The Socceroos also hosted a match in 2007 against Argentina, losing 1–0, as well as 2010 FIFA World Cup qualification matches in 2009 against Japan, which attracted 81,872 fans as Australia beat Japan 2–1 via 2 Tim Cahill headers after falling behind 1–0 late in the 1st half. In 2010 it was announced that as a warm up to the 2010 FIFA World Cup which the Australians had qualified for, they would play fellow qualified nation New Zealand on 24 May at the MCG. A 1998 FIFA World Cup qualifier between Australia and Iran on Saturday 29 November 1997 with 98,000 in attendance. The match was drawn 2–2, with Iran progressing on the away goals rule. An exhibition match between Manchester United and Australia on 15 July 1999 with 60,000 people in attendance. A friendly match between Brazil B and Australia on 17 November 1999 with 70,795 in attendance. An Olympic Tournament group match between Italy and the Olyroos on 13 September 2000 with 93,252 in attendance. Plus other preliminary matches during the Olympics which also included quarter final and the Semi final between Chile and Cameroon who went on to win the gold medal. A 2002 FIFA World Cup qualifier between the Australia and Uruguay on 20 November 2001 with 84,656 in attendance. The Socceroos won 1–0, however Uruguay progressed after later winning the second leg 3–0. A friendly match between Australia and the then European champions, Greece – which was played as a warmup to the 2006 FIFA World Cup. A friendly match between Australia and the All Whites as a warm up before the 2010 FIFA World Cup in which Australia won in the very last play of the game. A pre-season friendly in July 2013 between A-League outfit Melbourne Victory and Premier League side Liverpool, as part of Liverpool's pre-season tour of Australia and South East Asia drawing a crowd of 95,446. Panoramic image of the MCG in soccer mode ahead of a pre-season tournament match between Real Madrid and Manchester City (24 July 2015). In 1878 the Melbourne Cricket Club's Lawn Tennis Committee laid an asphalt court at the MCG and Victoria's first game of tennis was played there. A second court of grass was laid in 1879 and the first Victorian Championship played on it in 1880. 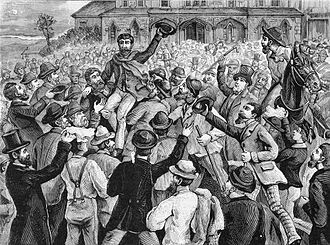 The first inter-colonial championship was played in 1883 and the first formal inter-state match between NSW and Victoria played in 1884 with Victoria winning. In 1889 the MCC arranged for tennis to be played at the Warehousemen's Cricket Ground (now known as the Albert Cricket Ground), at Albert Park, rather than at the MCG. It was at the MCG in 1869 that one of Australia's first bicycle races was held. The event was for velocipedes, crude wooden machines with pedals on the front wheels. In 1898 the Austral Wheel Race was held at the MCG attracting a crowd of 30,000 to see cyclists race for a total of £200 in prize money. Queen Elizabeth II visited the MCG in 1954 twice for an assembly and display. She attended a Richmond versus Fitzroy match on 5 April 1970, and also attended the Commonwealth Games Opening Ceremony at the ground on 15 March 2006. A record for attendance at the grounds was set by religious leader Billy Graham whose event in 1959 was attended by at least 143,000 people. The first rock concert to be held at the ground was one by David Cassidy in 1974. In 1978 David Bowie held a concert there. In 1993, Paul McCartney, U2 and Madonna held 3 concerts, with the highest attendances for a music concert at MCG, with 147,241 tickets sold. The Rolling Stones held concerts in 1995, Michael Jackson in 1996, the Three Tenors in 1997, Elton John and Billy Joel in 1998. Pope John Paul II held a service at the MCG on 27 November 1986, and a celebration there of the Polish community the next day. The MCG hosted The Police with Special Guests Fergie & Fiction Plane on Australia Day 2008; the first MCG concert in 10 years. The MCG hosted Sound Relief, a concert donating all revenues to the Red Cross Victorian Bushfire Appeal with performances from Kings Of Leon, Midnight Oil, Split Enz, Paul Kelly, Hunters & Collectors, Wolfmother, Jet and Bliss N Eso, among others. It was held on 14 March 2009. On 5 November 2010, the MCG was the starting point for The Amazing Race Australia. The MCG held a Guns N' Roses concert on 14 February, 2017. The MCG held a free The Killers concert on 30 September, 2017, after the 2017 AFL Grand Final. On 6 October, 2018, The MCG hosted WWE Super Show-Down. The MCG held a Eminem concert on 24 February 2019 with the highest attendance for a single concert at the MCG with 80,708 tickets sold. MCG from a city building. The Tattersall's Parade of the Champions undertaking is a gift to the people of Australia by Tattersall's and is a focal point of the Yarra Park precinct. 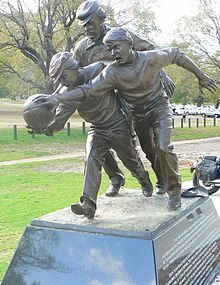 The Australia Post Avenue of Legends project aimed to place a minimum of five statues in Yarra Park, extending from the gate 2 MCC members entrance up the avenue towards Wellington Parade. The most recent addition of Kevin Bartlett was unveiled in March 2017. ^ "Biggest Stadiums in The World By Capacity". ^ "MCG Reserved Seating Map - Richmond". membership.richmondfc.com.au. Retrieved 14 December 2018. ^ Chappell, Ian (26 December 2010). "Heroes wanted: Apply at the 'G". Herald Sun. Retrieved 29 December 2010. ^ "Melbourne Cricket Ground, Victorian Heritage Register (VHR) Number H1928, Heritage Overlay HO890". Victorian Heritage Database. Heritage Victoria. ^ "Department of the Environment and Energy". Department of the Environment and Energy. Retrieved 14 December 2018. ^ Baum, Greg (24 September 2003). "MCG voted as one of the seven wonders of the sporting world", The Sydney Morning Herald. Retrieved 10 January 2016. ^ Levison, Brian (2016). Remarkable Cricket Grounds. Great Britain: Pavilion Books. ISBN 9781911216056. ^ "New stands may be needed for Melbourne Cricket Ground". The Argus. Melbourne, VIC. 27 September 1938. p. 20. ^ "Only 102,000 will get in for Games". The Argus. Melbourne, VIC. 18 September 1956. p. 5. ^ Products, Ancon Building. "Projects". ^ "Victoria vs. New South Wales, 1855–56". ESPNcricinfo. ESPN Inc. Retrieved 22 November 2013. ^ "Records / Melbourne Cricket Ground / Test matches / Match results". ESPN Cricinfo. Archived from the original on 23 November 2016. Retrieved 30 August 2015. ^ Gideon Haigh (26 December 2014). "How an overcrowded calendar delivered a Boxing Day Test classic". The Australasian. Melbourne, VIC. Retrieved 30 August 2015. ^ "Melbourne Cricket Ground". Cricbuzz. Retrieved 30 August 2015. ^ "Washout". ESPN Cricinfo. Retrieved 30 August 2015. ^ "ICC Cricket World Cup Final 2015 – the Grand Finale!". ICC. 29 March 2015. Retrieved 30 August 2015. ^ "Smith makes more history in MCG knock". Retrieved 2017-12-30. ^ "Football by electric light". The Argus. Melbourne, VIC. 14 August 1879. p. 7. ^ Peter Pindar (16 August 1879). "Football Gossip". The Australasian. XXVII (698). Melbourne, VIC. p. 204. ^ Ashley Browne (7 July 1994). "$500,000 facelift for Junction Oval". The Age. Melbourne, VIC. p. 26. ^ "Grand Final at MCG until 2057 as part of $500m mega-deal". AFL.com.au. 12 April 2018. ^ a b c d "Melbourne Cricket Ground – US Marines at the MCG". Archived from the original on 18 December 2013. Retrieved 10 December 2013. ^ 1956 Summer Olympics official report. Archived 12 September 2008 at the Wayback Machine p. 40. ^ 2000 Summer Olympics official report. Archived 9 November 2000 at the Wayback Machine Volume 1. p. 393. ^ Batchelder, Alf (2002). The First Football Matches on the Melbourne Cricket Ground (PDF). The Melbourne Cricket Club Library. p. 25. ISBN 0957807414. Archived from the original (PDF) on 2013-03-14. ^ "Melbourne Cricket Ground". rugbyleagueproject.org. Shawn Dollin, Andrew Ferguson and Bill Bates. Retrieved 6 July 2013. ^ Tristan Rayner (17 June 2015). "MCG sets record Origin crowd of 91,513". The Roar. ^ "Melbourne football club sees surge in popularity". Australian Broadcasting Corporation. 29 June 2006. ^ "Steven Gerrard delights the MCG crowd as Liverpool beats Melbourne Victory 2-0". ABC. Retrieved 5 December 2018. ^ "Memorable Moments". Melbourne Cricket Ground. Archived from the original on 17 July 2014. Retrieved 9 June 2014. ^ Sherwood Eliot Wirt (1997). A Personal Look at Billy Graham, the World’s Best-loved Evangelist. Wheaton, Illinois: Crossway Books. p. 60. ISBN 978-0891079347. ^ "MCG Attendance Records" (PDF). Melbourne Cricket Ground official website. Archived from the original (PDF) on 27 March 2014. Retrieved 18 April 2014. ^ "Amazing Race Australia filming in Melbourne". The Spy Report. 5 November 2010. Retrieved 24 January 2011. ^ "Heraldsun.com.au | Subscribe to the Herald Sun for exclusive stories". myaccount.news.com.au. Retrieved 2019-02-24. ^ "The Canberra Times, Monday 28 September 1970, "Incredible Win by Carlton in VFL"". Trove. Retrieved 16 October 2014. ^ "MCG attendance records". www.mcg.org.au. Archived from the original on 29 March 2015. Retrieved 1 April 2015. ^ "The Canberra Times, Monday 16 March 1959, "120,000 Attend Final Service By Billy Graham"". Trove. Retrieved 16 October 2014. ^ "Top 10 ICC World Cup Cricket Venues in the World". Sporty Ghost!. 16 December 2014. Retrieved 21 July 2015. 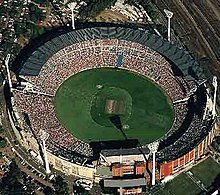 Wikimedia Commons has media related to Melbourne Cricket Ground. The England womens cricket team is the team that represents England and Wales in international womens cricket. The team is administrated by England and Wales Cricket Board, they played their first Tests in 1934–35 and their current captain is Heather Knight, and their current coach is Mark Robinson. There is an England Womens Academy team, consisting of players just below the full England squad. England were a part of the first Womens Test series, as their team led by Betty Archdale touring Australia in the summer of 1934–35, the team and their captain received warm responses from the Australian crowds. However, their player, and one of the best-known women cricketers of the era, was the allrounder Myrtle Maclagan. She scored the first ever century in a womans Test match on 7 January 1935, two years later, England suffered their first Test defeat, at the hands of Australia at Northampton. As Australia made their tour, an England team including seven debutantes conceded 300 on the first day. England recovered to take the second Test after a first-innings 115 from Myrtle Maclagan, who took five wickets opening the bowling. England began playing womens Test cricket again in 1948–49, when they toured Australia for a three-Test series, an England team with seven debutantes, lost the Womens Ashes to Australia after losing the first Test and drawing the final two. Both had Test experience from before the War, Maclagan was Englands leading wicket-taker on tour, with nine wickets, ahead of Hide and Mary Johnson who took six each. However, England still beat New Zealand in their Test one month after the conclusion of the Ashes, in 1951, Australia toured England for the first time in 14 years. Australia were 131 for eight after Duggan took four more wickets, they surrendered the Ashes again, despite winning the final Test by 137 runs after another Duggan nine-wicket-haul to draw the series at 1–1. Englands next international series involve a visit from New Zealand in 1954, England won the first Test, despite giving up a deficit of 10 on first innings, but drew the second and third, the third Test saw a whole days play lost to rain. The Big Bash League is an Australian professional Twenty20 cricket league, which was established in 2011 by Cricket Australia. The Big Bash League replaced the competition, the KFC Twenty20 Big Bash. The competition has been sponsored by fast food chicken outlet KFC since its inception, BBL matches are played in Australia during the summer in the months of December and January. It is now placed sixth in the list of most attended sports leagues in the world with respect to average crowd per match, out of the eight teams in the tournament, four have won the title at least once. The other three teams which have won the title are Sydney Sixers, Brisbane Heat and Sydney Thunder, the current champions are the Perth Scorchers. Earlier, the top two teams in the tournament used to qualify for the Champions League Twenty20 tournament and it was an annual international Twenty20 competition played between the top domestic teams from various nations. However, the CLT20 has now become defunct from 2015 onwards, a design contest was held in 2011 to determine the design of the Big Bash League trophy. The competition was restricted to Australian designers, with the final design and it had been proposed that the tournament would undergo expansion into more regional areas not supported by international cricket. The expansion was planned to be implemented in 2012, the proposed teams included, Canberra and Gold Coast. A New Zealand-based team was mentioned as a possibility which would be based at Auckland or Christchurch. Cricket expert Mark Waugh commented on Fox Sports that an expansion could dilute the player resulting in a sub-standard league. The expansion proposal was dumped, mainly because the proposed cities lacked the proper cricket hosting facilities. In 2015, former Black Caps captain and Melbourne Stars coach Stephen Fleming suggested expansion of the tournament to include New Zealand teams and he said an expansion into New Zealand would be widely supported by locals. His views were supported by Brisbane Heat coach and former Black Caps captain Daniel Vettori. Melbourne Renegades chief executive Stuart Coventry stated that he wants Cricket Australia to grant each club a home fixture next season. The Australia national cricket team, represents the country of Australia in international cricket. It is the joint oldest team in Test cricket history, having played in the first ever Test match in 1877, the team draws its players from teams playing in the Australian domestic competitions – the Sheffield Shield, the Australian domestic limited-overs cricket tournament and the Big Bash League. The national team has played 801 Test matches, winning 377, losing 215, drawing 207, Australia is ranked the number-one team overall in Test cricket in terms of overall wins, win-loss ratio and wins percentage. As of 29 March 2017, Australia is ranked third in the ICC Test Championship on 108 rating points, the Australian cricket team has played 898 ODI matches, winning 554, losing 303, tying 9 and with 32 ending in no-result. They currently lead the ICC ODI Championship, having done so for 130 of 161 months since its introduction in 2002. Australia have made a record seven World Cup final appearances and have won the World Cup a record five times in total,1987,1999,2003,2007 and 2015 and it is the second team to win a World Cup on home soil, after India. The team was undefeated in 34 consecutive World Cup matches until 19 March at the 2011 Cricket World Cup where Pakistan beat them by 4 wickets. Australia have won the ICC Champions Trophy twice – in 2006 and in 2009 – making them the first and the only team to become back to back winners in the Champions Trophy tournaments. 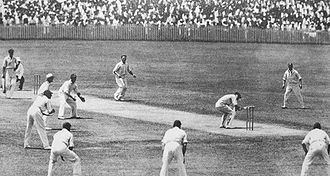 Test cricket, which occurred between Australia and England at the time, was limited by the long distance between the two countries, which would take several months by sea. Most cricketers at the time were either from New South Wales or Victoria, with the exception of George Giffen. A highlight of Australias early history was the 1882 Test match against England at The Oval, in this match Fred Spofforth took 7/44 in the games fourth innings to save the match by preventing England from making their 85-run target. This was the start of the famous Ashes series in which Australia, to this day, the contest is one of the fiercest rivalries in sport. It participated in between the 1897–98 English tour of Australia and the 1910–11 South African tour of Australia, Victor Trumper became one of Australias first sporting heroes, and was widely considered Australias greatest batsman before Bradman and one of the most popular players. The Indian cricket team, known as Team India and Men in Blue, represents India in international cricket. Governed by the Board of Control for Cricket in India, it is a member of the International Cricket Council with Test, One Day International. In its first fifty years of cricket, India was one of the weaker teams. From 1932 India had to wait until 1952, almost 20 years for its first Test victory. Traditionally much stronger at home than abroad, the Indian team has improved its overseas form since the start of the 21st century, winning Test matches in Australia and South Africa. It has won the Cricket World Cup twice – in 1983 under the captaincy of Kapil Dev and in 2011 under the captaincy of Mahendra Singh Dhoni. After winning the 2011 World Cup, India became only the team after West Indies and Australia to have won the World Cup more than once. It has won the 2007 ICC World Twenty20 and 2013 ICC Champions Trophy and it was the joint champions of 2002 ICC Champions Trophy, along with Sri Lanka. As of 7th March 2017, India is ranked first in Tests, fourth in ODIs, Virat Kohli is the current captain of the team across all formats, while former Test captain Anil Kumble is the head coach. The Indian cricket team has rivalries with other Test-playing nations, most notably with Pakistan, however, in recent times, rivalries with nations like Australia and Bangladesh and have gained prominence. The British brought cricket to India in the early 1700s, with the first cricket match played in 1721, in 1848, the Parsi community in Bombay formed the Oriental Cricket Club, the first cricket club to be established by India Ltdns. After slow beginnings, the Europeans eventually invited the Parsis to play a match in 1877, by 1912, the Parsis, Sikhs and Muslims of Bombay played a quadrangular tournament with the Europeans every year. In the early 1900s, some Indians went on to play for the England cricket team, in 1911, an Indian team went on their first official tour of the British Isles, but only played English county teams and not the England cricket team. East Melbourne is an inner suburb of Melbourne, Australia,2 km east of Melbournes Central Business District. Its local government area is the City of Melbourne, at the 2011 Census, East Melbourne had a population of 4,714. East Melbourne is an area of inner Melbourne, located between Richmond and the Melbourne Central Business District. Broadly, it is bounded by Spring Street, Victoria Parade, Punt Road/Hoddle Street, the world-famous Melbourne Cricket Ground is located in Yarra Park, in the East Melbourne locality of Jolimont. East Melbourne has been affluent since its first establishment and contains some of the oldest Victorian homes and terrace houses and parks, the Parliamentary and Cathedral precincts are located on a gentle hill, known as Eastern Hill. East Melbourne was one of Melbournes earliest suburbs and it was first planned in 1837 by surveyor Robert Hoddle, but was not actually settled until 1840, some time after neighbouring Fitzroy and Collingwood. Among the first settlers was Charles La Trobe, who built a dwelling in 1840 and wealthy professionals followed. The plan of the alignment of streets was adopted in July 1849, in the 1960s and 1970s, while other inner-city suburbs were experiencing gentrification, East Melbourne, traditionally a blue ribbon district, experienced a temporary decline. Flats began to appear and replace many of the old mansions, many remaining mansions had been converted to rooming houses over the years. The construction of the Hilton Hotel saw the demolition of Cliveden mansions, a five-storey Victorian era terrace, office development and expansion of the hospitals in the area affected much of the area surrounding Victoria Parade. During the 1990s East Melbourne once again experienced an increase in property prices. The Becton development at Jolimont, modelled on a picturesque Georgian village, many of the remaining mansions and terraces were placed on heritage registers and subdivided into apartments. Later the Victoria Brewery was converted into apartments, named TriBeCa. East Melbournes proximity to the city, its size and its relatively unspoilt streetscapes ensure its property is expensive. A crowd of over 10,000 fans welcome the Australian team on completing the first World Cup hat-trick – Martin Place, Sydney. Leisel Jones won four gold medals in the swimming competition, sweeping the breaststroke events and the medley relay. Qantas Airlines showcasing the logo of the 2006 Commonwealth Games. Yarra Park is home to the Melbourne Cricket Ground. The view from the Great Southern Stand at the Melbourne Cricket Ground prior to the match. Australia vs England in the second women's Test match in Sydney, 1935. Healy in her batting kit in the Adelaide Oval nets. The current Members Reserve at the MCG which was completed in 2005.